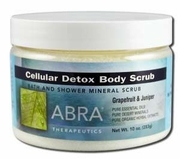 ABRA BODY SCRUBS PRODUCTS: Cellular Detox detoxifies skin cells, eliminates cellular debris and stimulates capillary circulation. DIRECTIONS: Use in shower or bath. Scoop a small amount into hand and gently scrub skin in circular motions, avoiding face and delicate areas. Rinse well. Botanical oils can be slippery, use a shower mat for safety. CAUTION: If irritation occurs discontinue use. INGREDIENTS: A natural mineral blend of 20% volcanic ash, sodium borate, sodium carbonate, and trace minerals, organic oils of almond (prunus amygdalus dulcis), olive (olea europaea), sunflower (helianthus annuus) and jojoba (simmondsia chinensis) infused with organic dandelion root (taraxicum officinal), and burdock root (arctium lappa), essential oils of grapefruit (citrus paradisi), juniper (juniperus communis), lavender (lavandula officinalis), lemongrass (cymbopogon citratus), cedarleaf (thuja occidentalis), and fir (abies sibirica), and natural vitamin E (mixed tocopherols).